Fourteen projects with combined peak production of 230,000 barrels of oil equivalent a day will start in the region this year, according to data from consultant Wood Mackenzie Ltd. That’s the most since 2007, reflecting the payoff from multi-year investments begun when oil prices were still over $100 a barrel. “It’s really the fruits of a very high level of investment in the 2010 to 2014 period,” Mhairidh Evans, senior research analyst for North Sea upstream at Edinburgh-based Wood Mackenzie, said by phone. After a long period of decline, production in the U.K. bounced back in recent years even as crude languished below $50. Executives gathering in the industry hub of Aberdeen, Scotland this week for the Offshore Europe conference will see reasons for both optimism and concern. Explorers are still making notable discoveries, while Total SA’s acquisition last month of A.P. Moller-Maersk A/S’s oil unit was a $7 billion vote of confidence in the region. Still, the lack of investment since prices plunged weighs on the outlook beyond 2018. “Really 2017 is the last year of that tranche of projects” started when prices were high, said Evans. 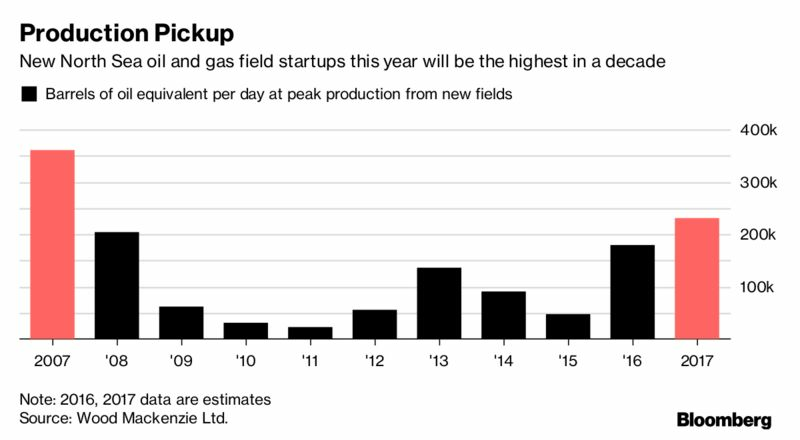 Wood Mackenzie expects the U.K. continental shelf to pump about 1.9 million barrels equivalent a day of oil and gas on average in 2018, with production from the new fields this year accounting for as much as 12 percent of that total. Brent crude, the global benchmark, traded at $52.34 a barrel as of 11:38 a.m. in London on Monday. Eight fields have already started up this year with an estimated peak production of 140,000 barrels of oil equivalent per day, Wood Mackenzie data show. Most recently, Total announced the start of its Edradour and Glenlivet fields in west of the Shetland Islands, which will add as much as 56,000 barrels of oil equivalent a day at their peak. That followed on from Cairn Energy Plc’s Kraken field in June and BP Plc’s Quad 204 in May. Investors will be watching for Premier Oil Plc’s Catcher project, which the company expects to bring on-stream in December. Next year, BP’s Clair Ridge project west of Shetland will further add to production, but the increase could stall beyond 2018 because fewer projects have been given the go-ahead since oil prices slumped in 2014. The International Energy Agency, which advises industrialized countries on energy policy, sees U.K. oil output declining every year from 2019 to 2022. “We urgently need to secure capital to bring new projects into the U.K. continental shelf to prevent the potential significant production decline that could occur post-2020,” said Mike Tholen, upstream policy director at industry lobby Oil & Gas U.K.